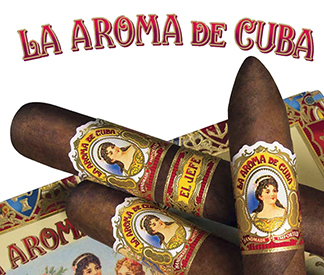 La Aroma de Cuba Cigars ~ La Aroma de Cuba Cigars in Belicoso, Churchill, El Jefe, Immensa, Monarch, and Robusto Sizes Are Available in Boxes and Singles at Milan Tobacconists. Ashtons La Aroma de Cuba cigars are beautifully handmade at Jose Pepin Garcia's My Family Cigars factory in Esteli, Nicaragua. The cigars were reblended in 2009 and feature a gorgeous Connecticut Broadleaf wrapper and rich, spicy blend of aged Nicaraguan long-filler tobaccos that combine to create a very enjoyable, medium- to full-bodied smoke. The high ratings and popularity of the "new" La Aroma de Cuba cigars confirm that Ashton successfully improved the flavor and quality without compromising the richness and spiciness that loyal La Aroma de Cuba smokers have enjoyed for years.